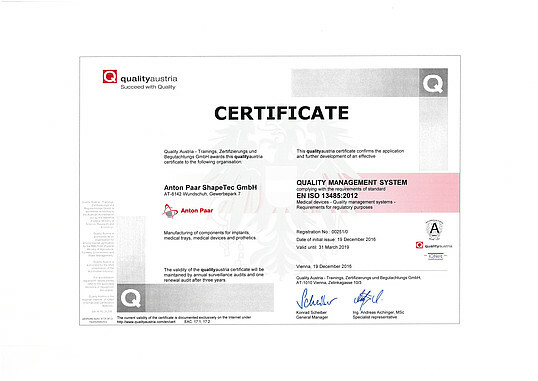 At the end of 2016 Anton Paar ShapeTec became certified according to EN ISO 13485 - Quality Management System for Medical Devices. Medical engineering is an important strategic business area with high growth potential for Anton Paar ShapeTec. Obtaining this quality certificate sets the stage for further growth in this area. Regular customers from the medical engineering sector have already been highly satisfied with Anton Paar ShapeTec's processes and product quality; the certification should now ease the business development of new customers. The subsidiary Anton Paar ShapeTec is located in Wundschuh, near Graz. Its products includes medical implants, prostheses, and surgical instruments. The company has been part of the Anton Paar Group since December 1, 2006.